On November 28 in Paris, Sotheby's will organize a second sale dedicated to the prestigious Qizilbash collection, after an initial large-scale sale devoted to furniture, sculpture and objets d'art. On November 29, a third session devoted to goldsmithing will complement this magnificent ensemble. 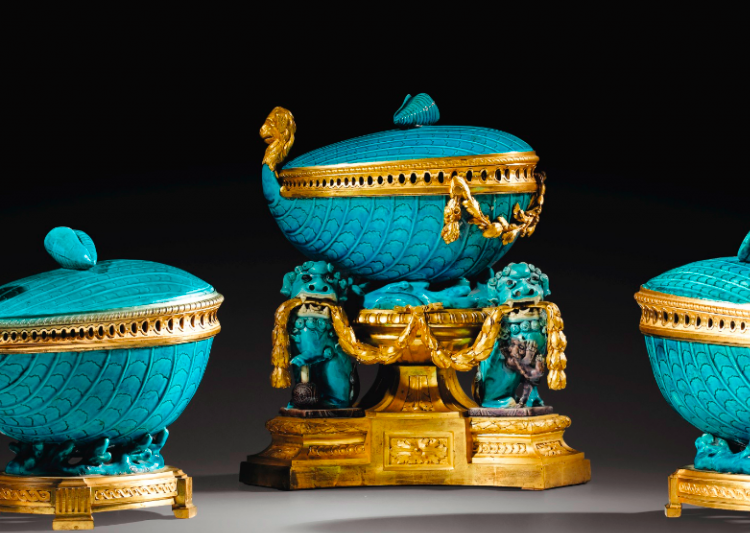 On 28 November, an incredible 280 treasures of European decorative arts from the 14th to the 19th century will be going under the gavel at Sotheby's in Paris. 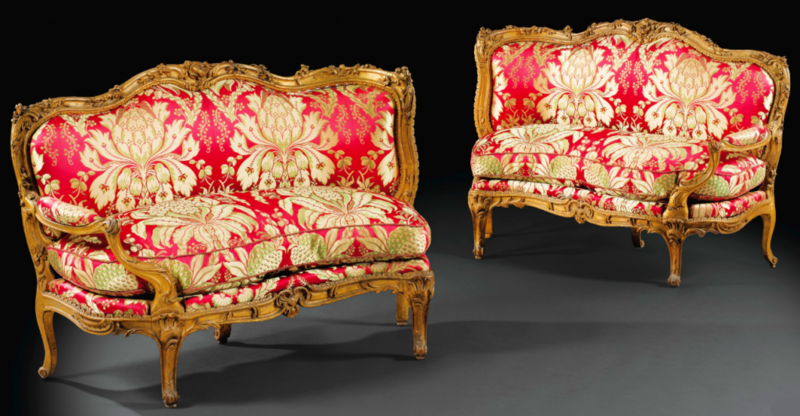 One of the highlights of the sale is an exceptional pair of sofas by Nicolas Heurtaut, estimated at $642 250 to $1 070 400, will set hearts racing for collectors of the crème de la crème of furniture. With a single arm and an asymmetrical form, these sofas are a stunning testimony to the master craftsmanship of the rocaille style from the late 1750s. 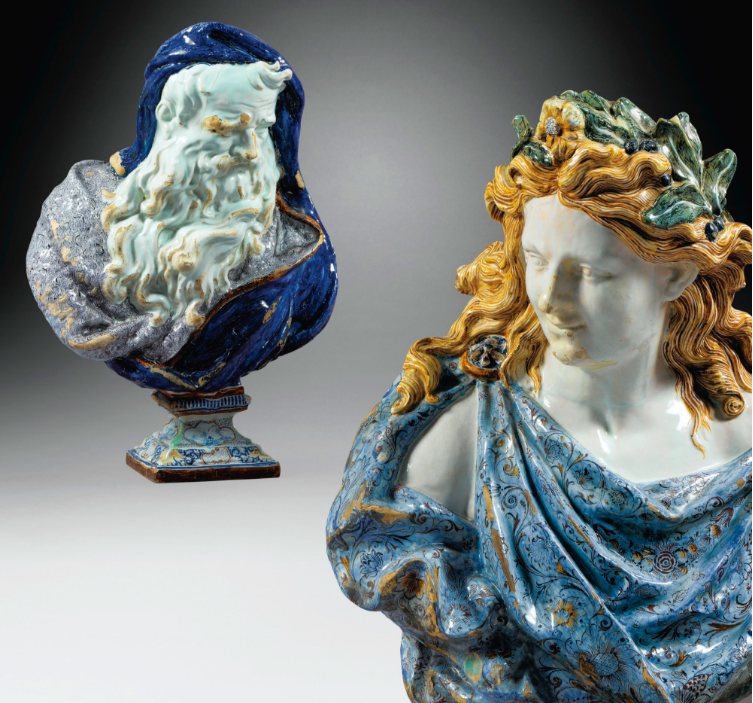 Two rare busts from the Seasons series, representing Apollo and the Winter, in faience of Rouen from the 18th century are outstanding pieces of decorative arts. 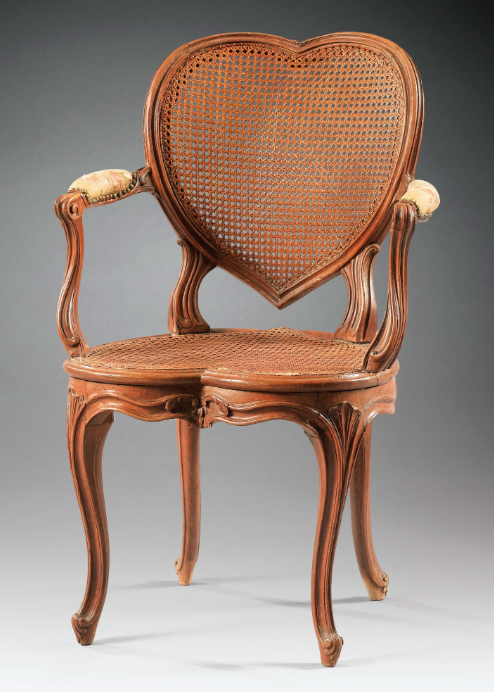 One of our favourites from the sale, this love-ly Louis XV period chair has been beautifully crafted into the shape of a heart. The sale will take place on November 28 at 10:30pm and 2pm CET. The public exhibition will be held from November 25 to 27 2016 at Sotheby's in Paris. More information at www.sothebys.com. This collection of nine lots is considered one of the most important private European collections of 17th and 18th century arts in the world. Hossein and Mariam Qizilbash built the collection, over many years, with the utmost care and attention to aesthetics. 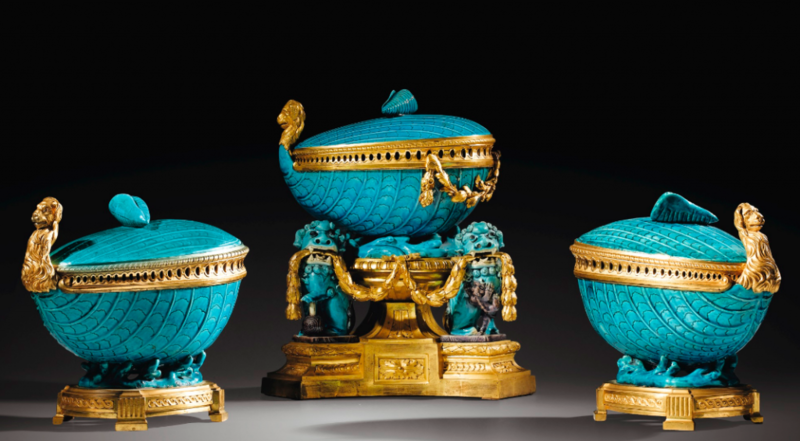 This Celestial Blue China porcelain from the Kangxi period (1662-1722), a sumptuous trio of porcelain pottery gilded with Louis XV period bronze of is estimated to sell for $1 070 400 to $2 140 800. This type of porcelain is extremely rare. It was developed by the merchant-mercier Juilliot and was particularly appreciated by Queen Marie Antoinette who owned several objects of this celestial blue porcelain mounted in gilded bronze. These 18th century pieces adorned with gold, silver and mother-of-pearl were crafted using a technique that required great precision in order to work with such expensive materials. The sale will take place on November 28 at 7pm CET. The public exhibition will be held from November 24 to 27 2016 at Sotheby's in Paris. More information at www.sothebys.com. On November 29, Sotheby's Paris saleroom will present 150 pieces of goldsmith pieces predominately from 17th to 20th century European. The auction will feature twenty teapots and coffee makers from different eras and styles. 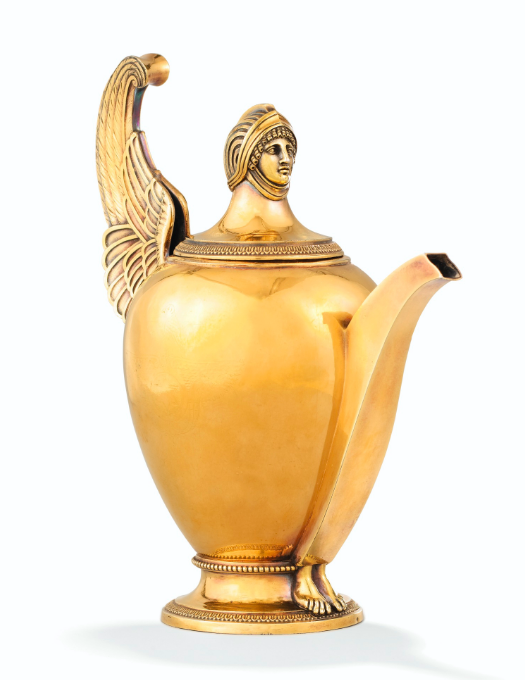 This vermeil teapot from the early 19th century has a wing-shaped handle and an Egyptian head-shaped cover. 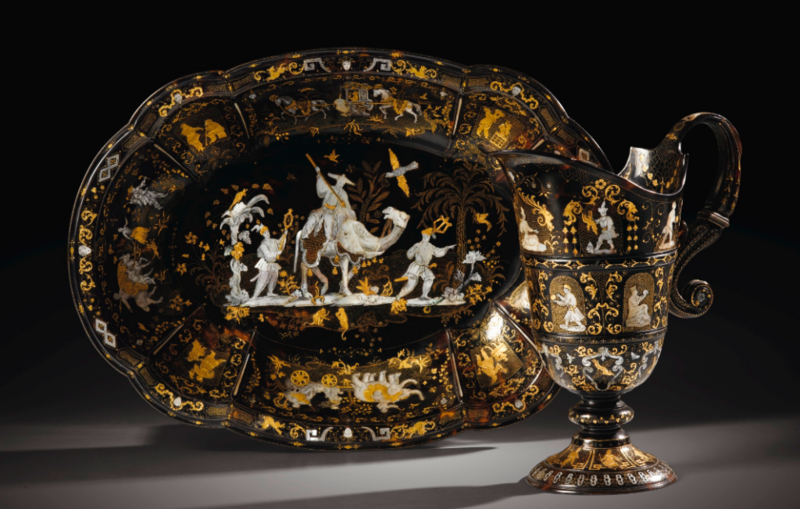 It was part of the David-Weill collection until 1972, and is a fine example of the resurgence of the Egyptian style. 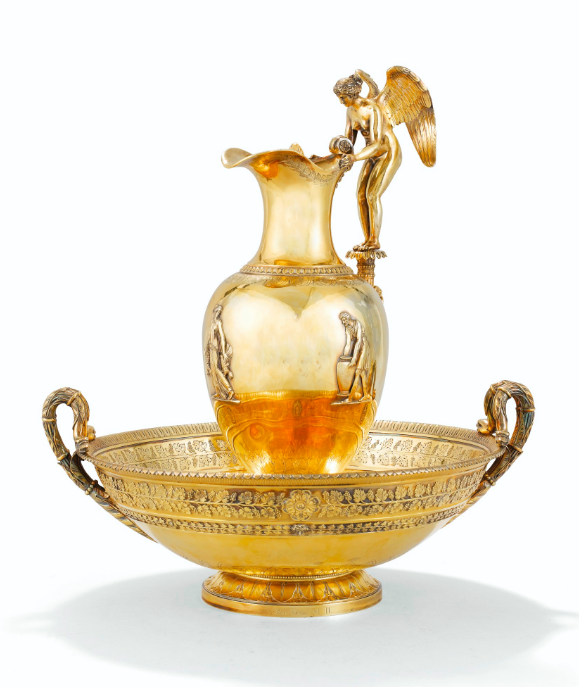 This is an ewer and accompanying gilt basin designed by Jean-Baptiste Claude Odiot. Odiot, an established goldsmith of the court and family of the Emperor Napoleon I, is renowned for his unparalleled precision and refined skill. The sale will take place on November 29 at 10:30 am CET. The public exhibition will be held from November 25 to 27 2016 at Sotheby's in Paris. More information at www.sothebys.com.